I’ve recently received several questions about using landscape fabric when growing cut flowers. This is a really important question for the cut flower grower, especially if you’re interested in growing in a more ecologically sound way. Q. I've been thinking about my summer mulching strategy and am wondering if you have some insight into my dilemma. The use of landscape fabric as a seasonal mulch is so popular with flower growers these days, and I've been using it on about half my garden beds over the past two gardening seasons, following the approach of burning holes and planting into them. I've appreciated how much it has diminished my summer weeding labor, but I am not certain it's best for my soil's health and biodiversity. When I pulled it up at the end of last season, I noticed the color and texture of the soil seemed diminished compared to leaf-mulched soil, and it was an absolute fire ant city under there! Not to mention, on a smaller scale where one bed isn't necessarily all one crop makes the rotation of crops over the course of the season really tricky with fabric. Still, living in the south where the heat and the weed pressure are so intense in the summertime, I do love the comprehensive weed suppression the fabric provides… I'm curious to hear your thoughts on these alternatives. Have you used landscape fabric in your garden, or know of anyone who's tested its effects on soil health? A. There are many problems with landscape fabric and you’re spot-on that it is terrible for your soil health. As you know from my course, health, and in particular soil health, is the secret to a great garden that’s less susceptible to pests, disease, plant failure. Why is landscape fabric such a problem? It’s mainly because the fabric blocks the cycling of organic matter in the soil. As a result you’re essentially killing off your soil organisms, which can cause all sorts of problems. My approach is all about replicating and enhancing the natural processes that happen already in nature, not thwarting them (which is what landscape fabric does). Does this require more effort? Yes, but when you weight that against the risk of crop failure from disease and pests and other issues that can arise, it’s 100% worth it. I fully understand that it’s hard to not be tempted by landscape fabric, especially if you are growing on a larger scale, or trying to expand your growing space. But if you can, see if you can shift away from using landscape fabric (and instead practice mulching as a way to reduce weeds which sporting your soil health). If you do use landscape fabric, wherever possible, replenish the soil at the end of your season; a good application of well-made compost and/or AEM’s are great ways to bring some balance back into the garden. Here is Part 2 of Reflections on the Emerging from Winter workshop with Soil & Stem in April 2018. Click here to read Part 1. 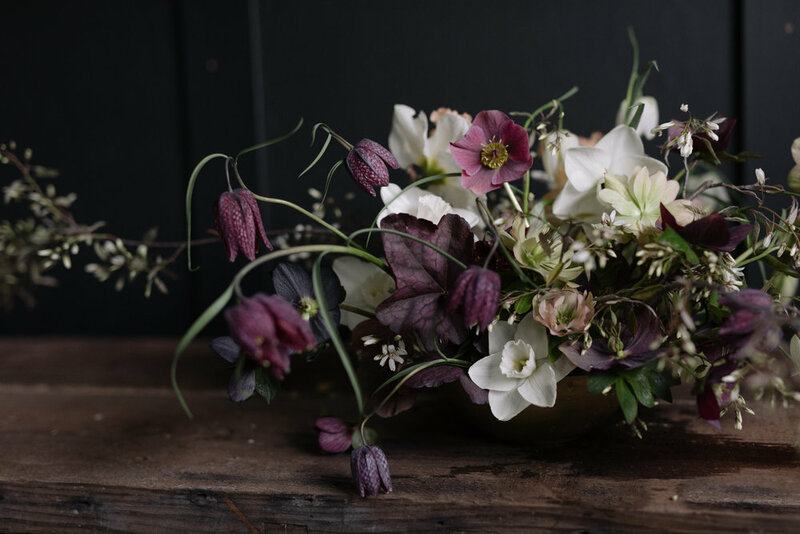 The flowers we worked with in the workshop included: specialty narcissus, parrot tulups, hellebores, ranunculus, fritiallaria, clematis, akebia, spirea, amelanchier, viburnum, quince, camellia, anemone and dogwood. I love reflecting on the individuality of the students who came to the workshop. 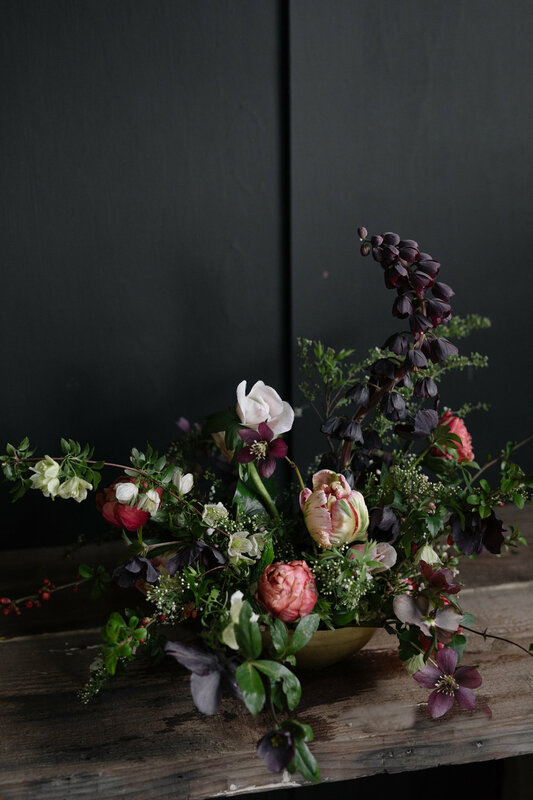 From their questions to their favorite flowers, from the color palette to the shape and flow of their arrangement, their finished arrangements are so unique and perfectly express the beauty of spring. Special thanks to the growers of these stunning flowers: Busy Bee Farm and Florals, Cartref Gardens and Ninebark Farm. And with gratitude for the support from A Fox in the Flowers, Charlotte and the Quail and Kelly Brown Photography. 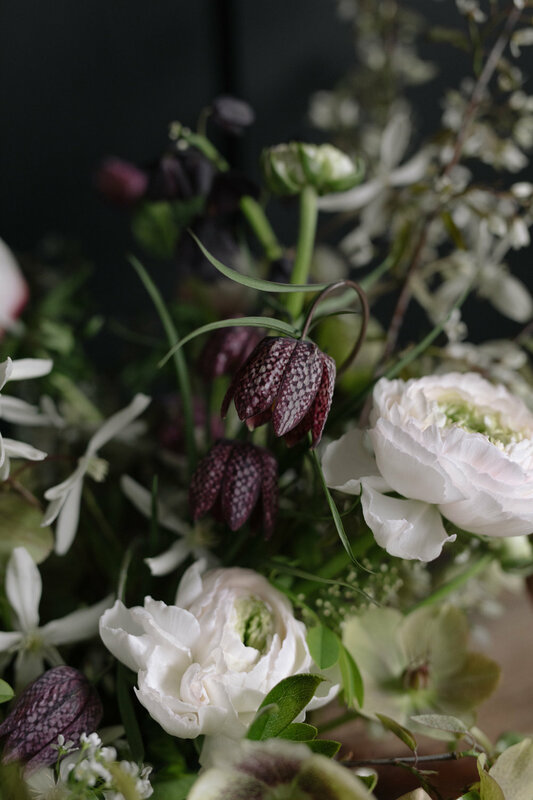 And thanks to the incredibly talented growers and designers who joined us for the workshop including Darlene, Kathleen, Carol and @houseatwindsor @backcountryblooms @littlebirdbloom @perennialgatherings @flower_fort @jillloveslace @alison.lopakka.joy. 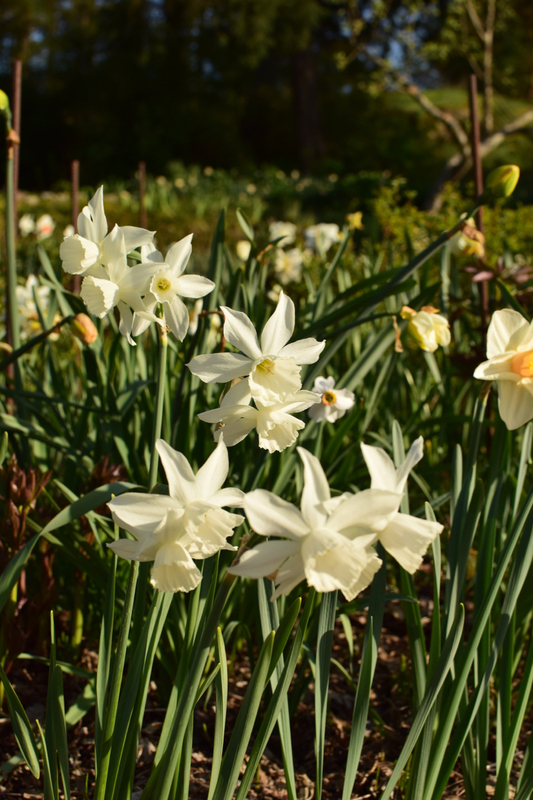 If it feels challenging to decide on what to grow in your cutting garden, one of the first things to consider is how those flowers will be used. 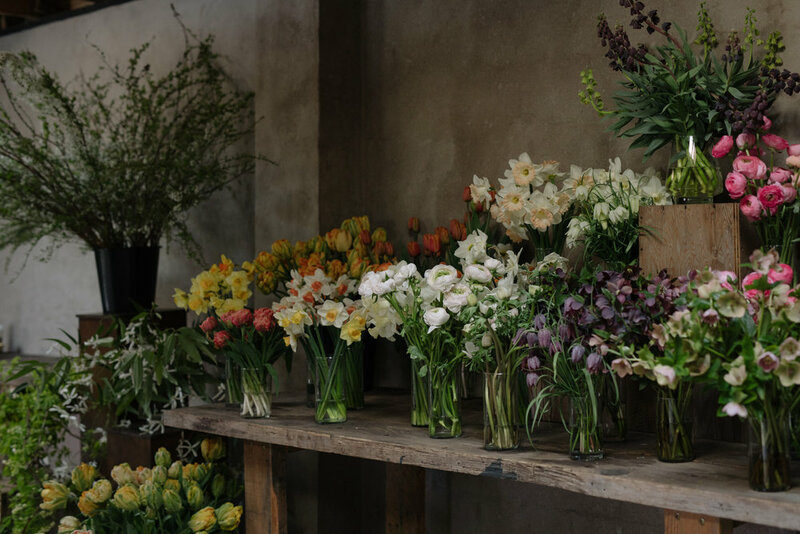 If you're growing for your floral design business, the types and colours of the flowers you choose will likely be different than if you're growing for market. 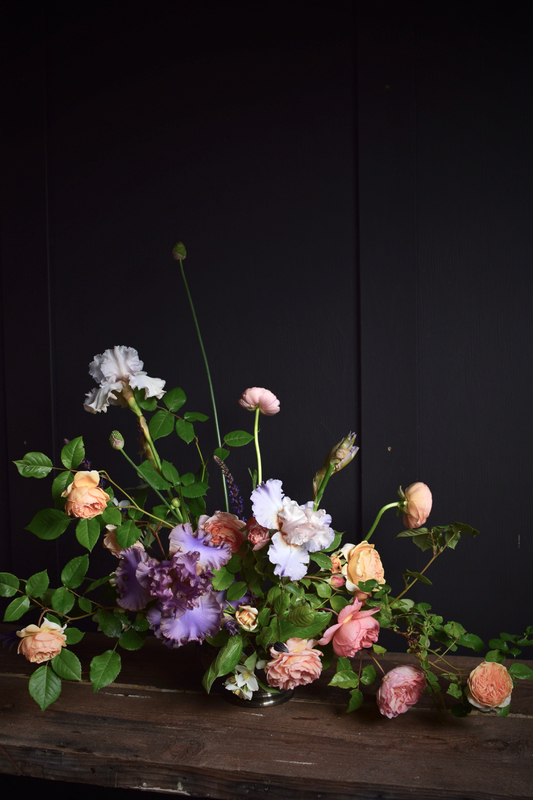 If you're aiming to sell your flowers at your own farm stand or a local summer farmers market, you want long lasting flowers that people will go crazy for. The first group of flowers you should consider are the cut-and-come again flowers. Dahlias, zinnias, cosmos all fall into this category. The more you cut (so long as you are feeding and watering well), the more flowers you will get. Next, consider the flowers that just have just a single bloom cycle. These can sometimes fetch a higher price - anything that has a shorter season is to be prized. Peonies are a perfect example. And if you really want to stand out, focus on unusual colours / varieties like chocolate sunflowers or single petaled peonies. As a little bonus tip, grow dahlias too. Some types of dahlias aren't as long lasting as the above flowers and can bake quickly in the heat of a summer farmers market so consider the long-lasting types like the pom pom or ball types. Given how much you can get from a single plant, and how much people love them, they make a great investment. Did you know that David Austin offers free design services for planning a rose garden?! I discovered this in their catalogue recently and the timing couldn't have been better. With a bunch of new roses about to arrive and the desire to move some old ones, I needed help. It’s a border alongside a 7’ high fence, the bed is 6’6” wide x 56’ long. The bed curves, facing east and south in roughly equal proportions (the eastern section gets late day shade). The other plants I’d like to incorporate include: a few flowering shrubs (1 of each lilac, mock orange, nine bark, hydrangea) as well as lots of ornamental alliums (drumstick + bulgaricum), and a few perennials (approx 10 each of heuchera, columbine, astrantia). I have some clematis that I’d like to incorporate with the climbers including Duchess of Edinburgh x 3, Ville de Lyon x 1 + Alpina x 3 + Tangutica x 1. I like an informal style. The garden is a cutting garden so I’d like to be able to access the plants at the back of the border without too much trouble (I’ve been wondering if it would be best to not put thorny roses at the front of the border for example). The image below shows you most of the bed (there’s a bit more on the left of the image). Thank you very much for your email asking for help in designing your rose border. Please find below a planting scheme which I hope you like. I started off by trying to include all the plants you listed but soon realized that there wasn’t enough space and so have left out all of the flowering shrubs as they all potentially grow big and take up a lot of space. As you say it is for cutting, the roses are spaced fairly well apart although having said that with the exception of Evelyn which is reasonably upright all will become quite large spreading bushes. You will see that I have suggested using both Leander and one of the Crown Princess Margareta as climbers as they are both vigorous and will be better for being trained. The spaces in between the roses are for you to fill with the perennials – all the ones you listed will look very lovely with the roses. as a general guide line it is important not to plant perennials right at the base of roses as they will take the lion’s share of water and nutrients leaving little for the roses. Some though could be planted right at the front of the border in front of the roses. You will though have to take into consideration accessing the roses and clematis at the back. You will see I have put three of the clematis in between the roses quite close to the roses so that they can have the chance of growing through them without overwhelming them. C. tangutica I have left out as it is very vigorous best grown into a tree. How fabulous. Thank you so much Michael and the folks at David Austin for offering such an invaluable resource. 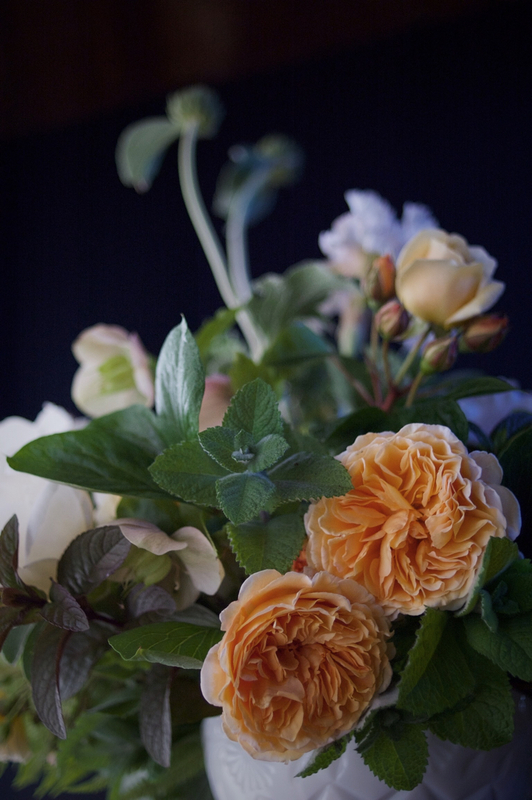 To learn more about David Austin roses, click here. In the spring of 2014, I posted on my old blog that 2014 would be the first year my entire garden would be outside the fenced area of our farm. The previous fall I had handed over my last plot of fenced land to the other farmers and expanded the large perennial garden outside our house that I have been building over the past few years. So, growing cut flowers with no fence in an area overrun with deer. You might think I was a bit crazy. But I approached this project very tentatively. I spent a few years experimenting with finding just the right plants that the deer won't bother and that I can use as cuts in the studio. 1. Peonies - no matter what's going on, the deer won't eat my peonies - either the flowers or the foliage. I planted a few in the middle of their path to be extra sure, and not a single nibble! 2. Dahlias - the deer will very occasionally nibble some of the darker pink and coral varieties but haven't done any damage to my cafe au laits or white dahlias. 3. Fritillaria - all varieties do well; I've seen the odd nibble on the growing tips of F. Meleagris but that's all. 4. Hellebores - I have a number of varieties around the garden and again, not a single bite on the flowers or the foliage. 5. Foxglove - all varieties are deer proof. In my Garden to Vase digital course, I share more flowers and types of foliage to consider if fencing isn't an option where you are. All I grew in the beginning was annuals. Then I started adding in perennials. What I wish I had done from day 1 was plant a few large trees (think magnolia, dogwood, katsura) and shrubs (think lilac, spirea, nine bark). Materials from these sorts of plants can really make your arrangements come alive. You can never have too much! Yup, I said it. You don’t need to worry so much about feeding your individual plants; and you need to worry even less about the feeding requirements of individual species. If you instead switch your focus to feeding the soil and supporting the overall garden ecosystem, the plants will take care of themselves. If you have clay, you should grow in raised beds. 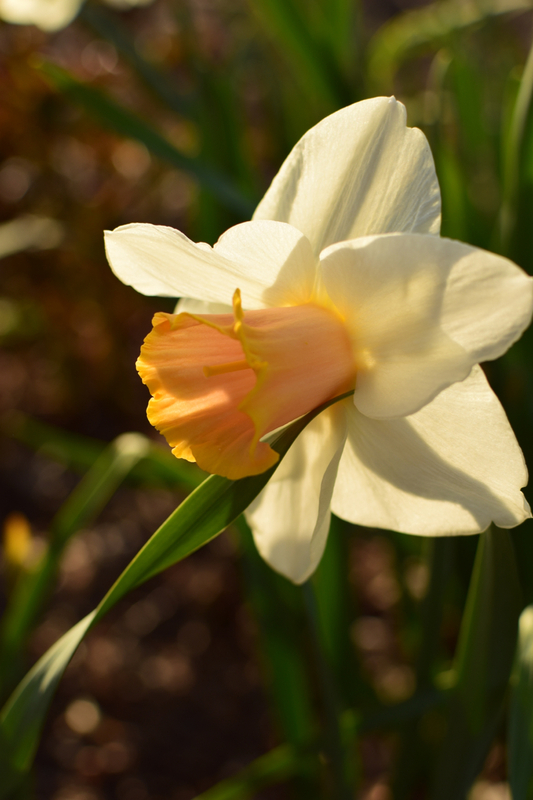 It will extend your season and make your gardening much easier. Doing this has let me overwinter my dahlia tubers in the ground, in addition to a bunch of other benefits. It’s great if your supplier gives you a good deal, or you get seduced by that flat of scented geraniums, but trust me, if you didn’t set out to buy it, and aren’t sure if you have room for it, don’t do it! Wait till you know you have a good, ready - to - plant spot. Instead of getting 12 Sarah Bernhardt peonies, get 3 Sarah Bernhardt’s, 3 Coral Charm’s and 3 Jan van Leeuwen's. And better yet, choose varieties that will bloom at different times; such as early, mid and late blooming bearded iris. I hate to break it to you but you need a lot of time to do the boring stuff that will let you revel in glorious blooms down the road - checking your irrigation and cleaning filters, cleaning your tools and buckets, maintaining your pathways, building compost piles (actually this is quite fun), not to mention the gripping task of weeding. Designate an hour or two each week to what Farmer Shellie calls her “Martha Stewart” days, and I promise, you will be rewarded.